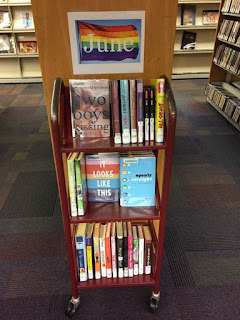 I put together this display in our YA area for Pride Month. I was glad we have such a nice selection of titles! Boyfriends with Girlfriends by Alex Sanchez is. story which is based on these days scenario. These days it is happen in our society whatever the author has mentioned in this book.The author has portrayed the real picture of the society.